Added 8-15-2014: This post ist outdated, please see here for more information on natively supported PCI-e network cards for OS X. 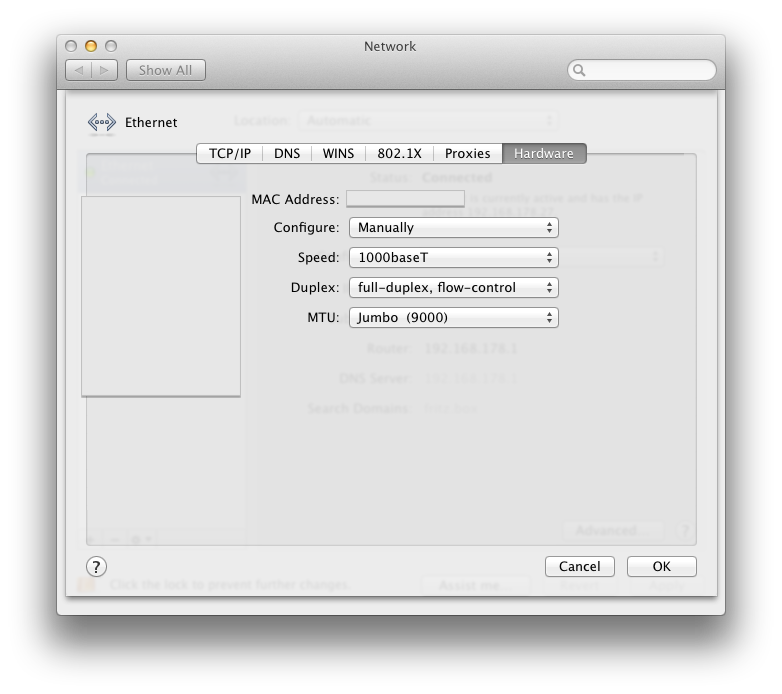 Native OS X support through the AppleIntel8254XEthernet kext, the NIC works out of the box! I’m finally getting consistent throughput results, even over a VPN. Since my QNAP NAS supports a MTU 9000 Jumbo Frame, transfer speeds from/to my NAS have increased as well. I got the HP NC360T from eBay for US$ 39, which seems to be a reasonable price. Previous PostKindle Fire reboot loop problem – solved! Did you ever test to see if Wake-on-LAN works with this card? I just did and it did not work. problem solved, had to use Clover as bootloader then it just worked. forgot to add, when booted with Clover bootloader from USB installer, NC360T works just fine. Tried both DSDT and non-DSDT, same blank screen before logon. Thanks OP for sharing this. My P6T (original) works fine with Lion/Mountain Lion except the on-board NIC can’t get the IP/DNS automatically, only IPv6 DNS works but super unstable. that’s why I bought a NC360T. Strange thing is, it freezes the startup and shows a blank screen right before reaching the logon, but I can boot up fine with the USB installer using the default Clover bootloader. Will try to install Clover permanently. But anyone experiencing the same problem? Is it possible to do link aggregation with this card ??? I’ve read somewhere that they work with any NC360T. After reading so many good things about the NC360T NIC from so many places on the net, I picked one up for my Mountain Lion 10.8.2 hackintosh. As promised, it does work out of the box without third part drivers being installed. However, I am having a frustrating problem where the NIC stops passing traffic. When this happens, I can move the ethernet cable to the other port and get a good connection again for a while. Eventually, the other port stops responding as well and I have to switch again. Any idea what could be causing this strange problem? Great write up. I’m in a similar position, have working onboard Ethernet, but dreadful data transfer rate to my NAS. What kind of through put are you getting after the new nic?